This oceanfront studio is calling your name! This studio features 2 full beds and boasts endless, panoramic views of the Atlantic Ocean. This oceanfront rental is ideal for 4 guests. 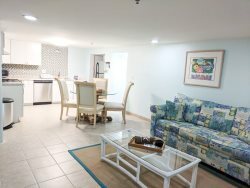 Other features include a private bathroom, microwave, coffee maker, cable TV, complimentary resort wifi, and fresh towels and linens for each guest.